This might be one of the worst things I have ever watched. Let's get two things out of the way. Undeniably, this video looks good. It's well drawn, well animated, and is certainly eye catching with its colorful visuals and impressively imaginative landscapes. As music, this is not something that's suited to me, but I can at least understand people who think that Porter's music is palatable to them. My problem with this piece is not related to the audiovisuals but rather with the idea that this should be taken as a story or a music video that is trying to be something more than just Porter's music meshed with beautifully animated sequences. I understand that these criticisms are often held back by the difficulties of critiquing something that isn't overtly concerned with story, but in a piece so unabashedly attempting to draw sympathy, there's fair ground here to levy some serious concerns. Shelter exemplifies everything that is wrong with storytelling in anime, namely that rather attempting to tell a real story developed with content and meaningful emotion, it takes the most abusive shortcut by designing a cute character, throwing her into a position of bittersweet melancholy, and using that as a means of manipulating our basest emotions into believing there is something meaningful and tragic to be said. People are praising the emotional resonance in the story and its ability to bring out the loneliness lost in the profundity of memory. Yet, consider a world where the main character is not a beautiful teenage girl, lost and confused in a world completely foreign to her. When you remove that physical appearance that makes us so inexplicably attracted to her stake in the story, there is ultimately no reason for us to feel sympathy. It is completely superficial. 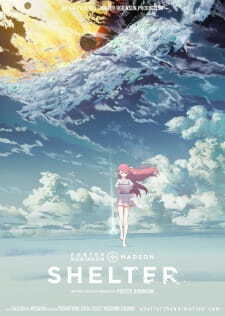 One might say that it's only a six minute short, but the fact that Shelter goes out of its way to show for a split second the main character's letter from her father, to invoke the community to spend time and read it on a second watch, tells me that there is a serious intent to manifest some semblance of a meaningful story. However, that is undermined precisely by the video's own neglect of that story. Much like many other anime designed purely for cheap tears and easy pity, we are given not substance, but rather a montage of a young innocent girl cherishing sweet memories with someone we barely meet. Sure it can be cute, but that does not preclude it from being utterly trite. Shelter offends its audience by presenting us with its fascinating visuals, the ostensible undertones of a post-apocalyptic world, the perceived loneliness of being potentially the last human in the universe, but gives us nothing more than the lowest common denominator of a story, one that galvanizes its sympathies out of the most mundane and pathetic tricks in the book, and half-expects us to take it seriously. I cannot in good conscience, recommend this music video to anyone. TL;DR: A short that has an amazing story to it. "Everyone wants to live in their own world." Due to the animation being about a 6 minute video, I had very low expectations as to how the story would go in this short. But, I was actually very wrong. It's not a very long story, but it's definitely something to make this animation worth looking into. A 17-year-old girl, Rin, is able to do anything in the world. But, there's a reason why she can do this. You find that out through the music video. The ending of the story isn't something you expected within the first 2 minutes. The art is amazing. There isn't a frame in which it doesn't have any effort into the detail. Almost every frame has such vivid colors and beautiful scenery, to the point that any frame could be a great background picture. It's literally about two characters. The main character definitely has gone through a lot in her life, which can make you sympathize with her. The other character I can't go into detail about, but they're very involved with the main character. It's a music video, 80% of this animation's soundtrack is only one song. But, I would say the song is very fitting as to what the story holds within this anime. I wanted to cry. When I finished it, it kind of made me feel very sad, yet happy. The story was meant to be happy and sad, and I think it did a great job as to what happened. This is only a 6-minute animation, but if they were to ever make a real movie adaptation of this animation, I would watch it in a heartbeat. So, the * means if the animation WERE to get a movie adaptation, in which I doubt, I'd give it a 10. It's very rare when you get something that is so simple, but yet so powerful. Shelter really reminds me why I love anime. It gives us such unique and fantastic experiences that's hard to find anywhere else. I'm a huge fan of EDM/dubstep and Porter Robinson is definitely one of my favorite artists in the genre. I've known for some time that he's an anime fan (for example, in his song Flicker you can hear Remon Yamano's infamous laugh), but I'm so glad that Crunchyroll and A-1 collaborated with him and made such an awesome project. We need more stuff like this. Anyways, Porter and Madeon's recent co-production, Shelter, was used as the basis for this animation and it fit very well. The animation was colorful and fluid. The virtual world that Rin lives in really comes to life and is very pleasant to watch. Over the course of 6 minutes, we watched our mysterious protagonist Rin, and learned about her circumstances and her past. There was barely any dialog and it had a huge reliance on visual storytelling and of course, the music. As each scene goes by, you try to figure out what's going on little by little, and the fragments of her past start to slowly but surely piece together. The truth of Rin and her virtual world really hit me hard, and the staff did a great job with the build up and the reveal. The animation worked so well with the music, and the cuts were really well done. Shelter's message was very impactful. It shows us the power and weight of unconditional parental love and that our past, no matter how painful, gives us strength to move forward. Shelter is short, but hits deep. It is a great reminder why anime is such an amazing medium. Porter's vision and imagination made this work come to life, and I'm happy that I was able to experience it. Please do yourself a favor and give this a watch. Shelter tells the story about a girl that comes to realize the situation that she is in, and how it affects her. The story details the ways in which her life played out before an "incident" and the aftermath of it. A really well produced and powerful piece of art that really tells a nice story. The only thing that hampers the work is its incredibly short length, although I also think that that is one of its strong suits. Very touching, and very well thought out. If this could be turned into a full project I would absolutely watch more. There is definitely potential for a great series to come out of this and I would be very happy to see more of it. All in all, a great experience and one you should check out, its only six minutes long, so why not.